Ovivo® is proud to announce the latest development of the proven Brackett Green® dual flow bandscreen, which has become the global reference design for the screening of large power and industrial water intakes. The newly re-engineered and optimized design is the result of over 100 years of experience and know-how while retaining the field-proven performance of the Brackett Green brand that you have learn to expect. 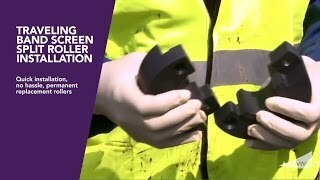 The Brackett Green® dual flow band screens are custom-designed for each application and can incorporate specific features to suit individual operating and site conditions, water levels and design codes. This can include seismic qualification and design for nuclear safety-related cooling water duty. Other options include a fish recovery and return system, which recovers and returns captured fish intact to the water body, as well as adaptations for handling large volumes of jellyfish. The Brackett Green® dual flow band screen design eliminates any risk of carryover in comparison with a through flow design where debris not removed at the deck level goes into the clean water area. Materials of construction range from coated carbon steel to 316 or duplex stainless steel and can include provisions for either sacrificial anode or impressed current cathodic protection. A reduced head height, simplifying access for inspection/maintenance, improved aesthetics and reduced crainage height. A highly optimized mesh support (basket) that maximizes the open area resulting in an increased flow per metre (foot) of screen width, thereby reducing the screen width required for a specified design flow. A reduced screen width decreases the drive power and washwater requirements, thereby minimizing CAPEX & OPEX costs. 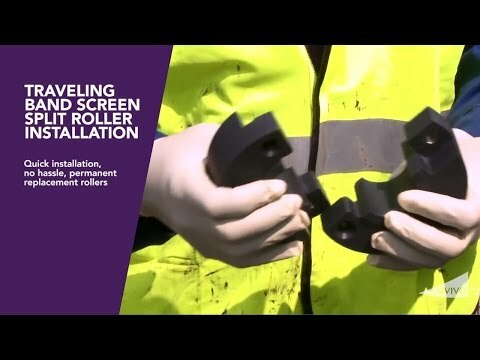 A reduced screen width with optimized mesh support (basket) structures, which minimizes the main-chain dead loads, thereby extending chain and roller life, reducing OPEX costs. Improved roller geometry resulting in reduced drive power requirements. PLC controlled, variable speed drive (VSD) that closely matches the screen speed to process conditions, thereby minimising OPEX costs. Optional Fish Recovery & Return (FRR) for compliance with environmental legislation, such as US EPA 316(b). Replaceable tracks and wear strips to extend plant-operating life. Optional replaceable sprocket rims to extend sprocket/chain life. Available either as a dual flow screen for new projects, or as a dual flow conversion for existing through-flow intakes. Manufactured in a range of materials including carbon steel, austenitic stainless steel and duplex stainless steels. Water passes through the dual flow band screen’s endless band of screening panels. Any debris collected on the mesh panels is raised to deck level and removed by backwashing. Main chains (supported by two sprockets above the deck) carry the screening band, and an electric motor on a shaft-mounted reduction gear unit provides the drive. While underwater, the main chains run in guide sections fitted with wearing strips located in a self-supporting fabricated frame. The main chain guides and head frame assembly (complete with drive gear) are contained in a freestanding, fabricated steel frame that is manufactured in sections and installed directly into the screen chamber. This design reduces civil work and eliminates the need for alignment of chain guides as built-in components. Additionally, this style of frame construction allows for sections of the screen to be removed for periodic maintenance, eliminating the need to lift the entire screen out of the chamber for each maintenance interval, thereby reducing headroom space requirements and equipment downtime. For sites that require fine mesh or where particular types of debris may bypass the screen, a flexible, neoprene contact seal, which is attached to the main structure and is in contact with the main chain sealing fins is available. Through our experience in designing band screens for water intakes, Ovivo has determined that the dual flow (DF) or out-to-in flow pattern is the most suitable flow pattern for the majority of water intakes. With this pattern, the water exits through the back opening after flowing through the mesh panels to the inside of the screen. Debris cannot be carried over to the clean water area and it produces a converging flow, which is preferable when the pump is close coupled to the screen. Central flow: For some applications, a central flow (CF) or in-to-out flow pattern is sometimes preferred. This flow pattern, commonly supplied in a “frameless” design, also prevents debris carryover. Through flow: The through flow pattern has the advantage of a simplified civil structure compared with DF and CF band screens, but does not eliminate debris carryover. Ovivo can design and supply screens with this flow pattern for existing through flow installations and can offer a through flow to dual flow conversion allowing the benefits of a DF screen to be realized without modification to the existing civil structure.